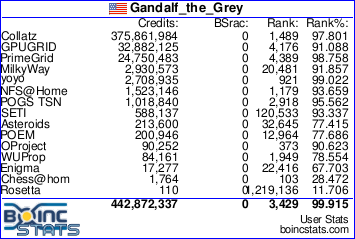 My BOINC STATS Signature image shows the WCG and the Einstein Projects. I also have credits with Asteroids@Home and Milkyweay@Home. However, neither of those projects has shown up yet. When I broach the subject, I get the response of just give it time. My question is what does Einstein do that the other two Projects apparently do not do to report data to the BOINC STATS? I'm think that perhaps these Projects may just not know what is required for their members' credits to be registered. I got credits, but BOINCstats doesn't show them. BOINCstats depends on the XML output of the projects. BOINCstats checks for XML updates every half hour, and, when available, downloads them, and reads the content to update the current-credit. Once a day all stats are updated, and all info from the XML files is pumped into the BOINCstats database. Sometimes the XML output is delayed, or there isn't any XML output for an extended period due to (server) problems at the project. When this happens, it's impossible for BOINCstats to update, and your new credits won't show on BOINCstats, until XML output is resumed. That might be a "split CPID" problem. See the FAQ entries at BOINCstats.